Nottingham station fire: What do we know? 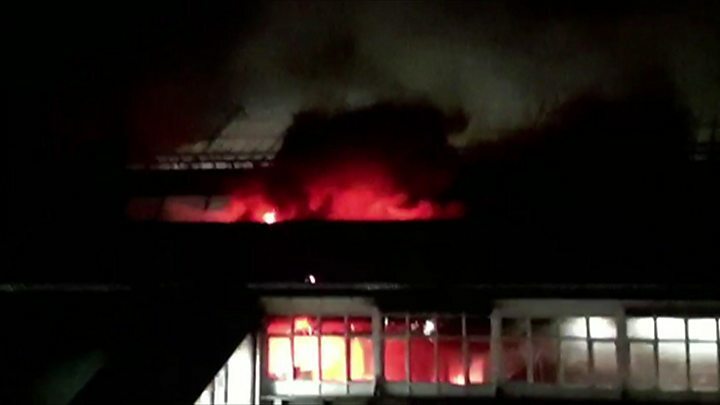 A major fire caused chaos at Nottingham railway station despite recent modernisation work. But what is known about the cause and how it spread? The blaze, which is being treated as arson, started in a women's toilet block on Friday 12 January. As investigations continue, questions have been raised as to what fire safety measures were put in place during a recent £60m redevelopment. Network Rail, which owns the station, said it would be inappropriate to comment on this while investigations are ongoing. The fire started in a set of women's toilets on the new side of the station at about 06:30 GMT on Friday. A member of staff told the BBC they had seen smoke coming from a sanitary bin in the toilets. British Transport Police said the cause of the fire was still under investigation but officers believe it was "arson of some description" and an electrical fault has been ruled out. Police say they have gathered "initial evidence" which suggests the fire was arson but they cannot release further information for operational reasons. No arrests have yet been made yet but British Transport Police is examining CCTV footage to see who was in the area at the time of the fire. Officers have already spoken to several witnesses and are keen to speak to any other witnesses who have not yet come forward. Were fire safety measures in place? A fire risk assessment would have been legally required ahead of the station's redevelopment, which was completed in 2014. Measures such as alarms, fire doors and perhaps sprinklers would then have been put in place to control identified risks. Incident commander Bryn Coleman, who was in charge of the fire fighting operation, said there were no sprinklers going off and he did not believe there were any sprinklers in the building. There is no legal requirement for railway stations to have sprinklers, but Mr Coleman said the fire could have been over within an hour if sprinklers had been installed. Network Rail said in a statement: "Every station is assessed for fire safety and regularly reviewed. "If there is anything we can learn from the official investigations we will, of course, do so but it is inappropriate to comment on detail while those investigations are ongoing." Councillor Jane Urquhart, who was in charge of planning and transportation when the station was redeveloped, said the findings of the investigations will have an impact on how the station is repaired. "We hope that we will find some answers about how it started and why it spread so quickly and we will have to then think about what that means for how it's rebuilt and redeveloped," she said. The fire broke out in a new part of the station called the Southern Concourse, and the damage was contained mainly to this area. It started spreading across what fire fighters described as a "wooden walkway" towards the older part of the station, but they prevented any major damage to the older parts. East Midlands Trains managing director Jake Kelly said the damage was "fairly extensive" but "less than we might have feared". "One of the things that is heartening about this is that the lovely main concourse [the old part of the station] largely escaped unscathed," he said. The rail firm said work was still taking place to assess the damage to the station so it was unable to estimate the cost and length of any repairs. How was the station redeveloped? The redevelopment of the station was a joint project between Network Rail, Nottingham City Council, East Midlands Trains and the Rail Heritage Trust. The main three-year programme of work was completed in November 2014 and aimed to create a "world-class transport hub" which also linked up with the city's tram network. A new glass-fronted extension was added to the station, called the Southern Concourse. The station's Edwardian Grade II* listed frontage was also transformed to create "a modern passenger environment". Finishing touches - including restoring the station's ornate terracotta decorations - were completed in July 2016. Trains going in and out of Nottingham were cancelled on Friday but the station reopened at 04:45 on Saturday, and a "near to normal" service was running by Sunday. Mr Kelly said the ticket office had been "very badly damaged" so staff were using portable ticket machines. The water supply for the entire station had also "been melted", he said, so temporary portable toilets have been put in place.